King Kangsa is a cruel and merciless man to fellow human beings. One day King Kangsa was visited by Hyang Narada, Wiku of Sorgaloka, who informed that he would be killed by Dewaki's eighth child. After that, Hyang Narada returned to Sorgaloka soon. Dewaki is the king's aunt's aunt and he is the wife of Wasudewa (Basudewa). After King Kangsa received notification by Hyang Narada, there was an evil intention to kill Dewaki's son so that the word Narada did not happen. At that time Dewaki had no children yet. Some time passed, Dewaki began to conceive. When a baby is born, it is immediately killed by King Kangsa. This incident repeatedly until Dewaki gave birth to the sixth child. While pregnant with the seventh baby, the baby still in the womb was moved by the goddess Nidra (goddess of sleep) by a supernatural way to Rohini, the second wife of Wasudewa. After the time comes, the baby is born safely and is called Baladewa or Balarama. Dewaki conceived again eight times. Wasudewa got a sense to save the baby to be born. If the baby is born then it will be replaced with another baby. It was coincidence that Yasoda, Nanda's wife, was a shepherd. When Dewaki gave birth, Yasoda gave birth. Immediately the baby was exchanged. When King Kangsa heard Dewaki gave birth to the eighth child, he immediately went to Dewaki's house. King Kangsa did not know that the baby had been exchanged, so he killed the baby that was actually Yasoda's son. Meanwhile, the eighth child of the Dewaki survived and was named Krishna. After Big Kresna he has supernatural powers. His courage is spreading everywhere so King Kangsa heard it again. Krishna then called over to Matura, will be pitted with the famous and powerful people. Nanda, who entered Krishna, became sad. He knows King Kangsa is so cruel. Therefore he always prayed for Krishna. During Matura, Krishna was told to do the work that ordinary people can not do. It means that Krishna can not afford to be punished. 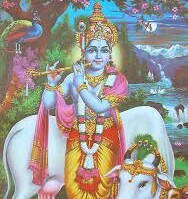 But what happens otherwise, all work can be done easily by Krishna. He was told to pull a bow that no one was able to attract him, to defeat the elephants, to join the strong men. Seeing the strength and beauty of Krishna, King Kangsa became angry because it felt defeated and brave. The wrath was not merely applied to Krishna, but to all the shepherds. So the shepherds were told to leave Matura immediately, and if not then they would be killed. Krishna was very angry about it. So there was a fierce fight between King Kangsa and Krishna. King Kangsa was defeated and died. The word Narada is proven. After King Kangsa died, Krishna left Matura and married the goddess Rukmini, the daughter of King Bismaka from the land of Widarba. The marriage was accompanied by a great war because of the secret of Dewi Rukmini being ripped off by Krishna. After the war, Krishna lived in Dwaraka (Dwarawati) with the goddess Rukmini and became king in the country with the title Batara. Krishna is very powerful and even dare to fight with God. Once upon a time Hyang Narada gave a flower to the Rukmini goddess. Dewi Setyaboma, the second consort of queen. Krishna agreed to beg the flower. Hyang Indra did not allow and there was a great fight because each of them brought out his miracles. Before anyone was defeated, Dewi Aditi came, mother of the goddesses. Finally Krishna was allowed to take the flower of the Arrival at will. Sri Krishna is the goddess of Vishnu who is in charge of protecting the Pandavas in which the Kurawa dholimi and won him in the western war. Before the war began Kresna appeared as ambassador ambassador to Astina in order to resolve the conflict struggle Astina kingdom. Kresna's mission is to avoid war. Pandavas requested half of Astina's territory to kurawa, if not given the Pandavas willingly accept only five rural areas namely Awisthala, Wrekashala, Waranawata, Makandi, and Awasana. However the Pandavas continue to go peacefully. But Duryadana resisted the crude of Krishna's request, even with all the power of Kurawa trying to destroy Krishna. In desperate circumstances Krishna turns into a giant and will destroy Kurawa, but Batara Narada prevents it and explains that according to the Fifteen Literary Writings Baratayuda must occur. Finally Kresna undo his intentions. Sadly the war of Baratayuda will occur, with Kresna's cleverness trying to slowly undermine Kurawa's position among others by asking Karna to favor Pandavas, but feel aware that he is indebted to Kurawa and is more interested in Astina though Kurawa is on the side of the ru named Jara approached the place from the forest and from a distance saw Khrisna's left leg partly visible and deer considered. He released his bow, took an arrow, and finally stabbed Krishna's foot. He ran up and he watched a man in a yellow robe doing yoga. The hunter immediately touched Krishna's leg and apologized. Shri Krishna opened his eyes and advised the hunter. He tells the hunter about his previous life of Bali who was killed by Shri Rama. Shri Krishna journeyed to heaven, thus filling the whole sky with glory. After passing by the God of Indra in heaven, he reaches his universe at a higher level. Arjuna cremated Krishna and Rukmini, Sati and burned in a pile of wood. The rest of the Dwaraka women became hermits and nuns. After each and every living creature from Dwaraka moved elsewhere, the sea appeared and swallowed the city, leaving no trace of land from Shri Krishna. It is believed that Shri Krishna lived on earth with Balarama's brother for 126 years and 5 months. According to researchers and scholars, He disappeared on February 18, 3102 BC. The era after his departure marks the beginning of Kali Yuga. It is said that Krishna had predicted that just seven days after the Lord's disappearance, the Dwarka Gold city and Dwarkanath Temple in Gujarat would be drowned by the ocean. This is more or less the historical origin of Sri Krishna or Basudewa in the Mahabharata story.